The latest rendering shows the top of the development set back from the street and the white “eagles building” in front, however, it does not show what the development will look like along Broadway. Image courtesy of Ald. Cappleman’s office. 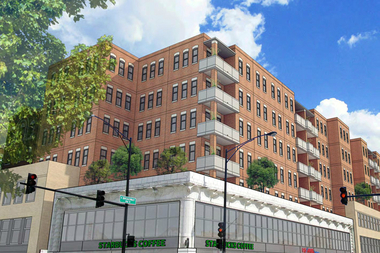 The development at 3817-45 N. Broadway has been granted approval for a zoning change. Developer Dave Gassman can now proceed to build a mixed-use development that will include 93 residential units and retail space. More information regarding the development can be found at DNAinfo. This entry was posted in Community News, Ward 46 and tagged real estate development on May 11, 2015 by elvn_updates. The 19th Chicago Police District has a new commander, Robert Cesario. There will be an open house at the 19th District, 850 W. Addison, on Thursday May 28, 2015, from 6-8 p.m. to welcome Commander Robert Cesario. The public is invited to come and meet Commander Cesario. This entry was posted in Community News and tagged 19th District on May 11, 2015 by elvn_updates. Lakeview Pantry will be moving to 3945 N. Sheridan Rd, the two-story building in which The Houndry was located, across from the red line Sheridan stop. Construction starts in September 2015, and the Pantry will move in March 2016. Also, the 2015 Hunger Walk takes place on June 20. Registration information can be found on Lakeview Pantry’s site. This entry was posted in Community News and tagged Lakeview on May 11, 2015 by elvn_updates. 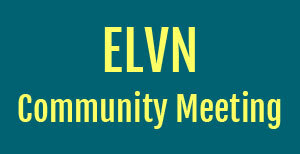 The next ELVN General/Community Meeting will be held on Tuesday, June 2, 2015, at 7:00 p.m. in the Community Room of the 19th District Police Station, 850 W. Addison St. Please join us to find out what is currently happening in East Lakeview, and bring any concerns you would like to share regarding our neighborhood. This entry was posted in Community News, ELVN News and tagged ELVN on May 11, 2015 by elvn_updates.